Banner brackets adjust up or down 1-1/4" to ensure the flag is taut. Screw gear bandings are sized to fit around practically any light pole. Flags not included to save money for customers that have previously purchased banners. All equipment needed to mount (1) 36"w banner is included, no trips to the hardware store required. 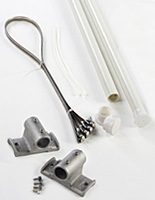 These banner brackets come with all the components necessary to mount 36"w flags. 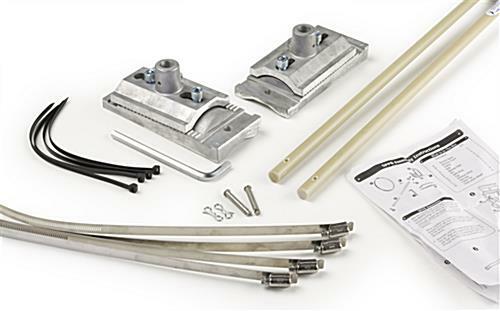 The components of this hardware set are extraordinarily durable. The fiberglass poles will not break in moderately windy conditions. 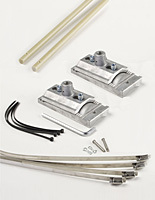 The purchase of these banner brackets include zip ties that connect to ringlets in your street flags and holes machined into the cast aluminum brackets. The zip ties hold the street flags in place, ensuring they do not "bunch-up" or fall off the poles. These banner brackets, called flag mounting hardware, are more functional than most other units on the market, in addition to being more durable. Each of the two supports adjusts up and down 1-1/4" to ensure each flag is taut for a pristine presentation. Adjustments can be made while the units are mounted on a light pole, with a flag on display. The banner brackets have teeth that interlock, ensuring both sides stay in position. Simply tighten the bolts with the included Hex wrench to secure each bracket at the desired height. 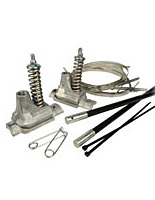 The screw gear bandings are sized to affix to most outdoor uprights or light poles. The screw gear bandings have a quick-opening, worm drive to allow fast tightening and quick removal of the banner brackets. These units can hold a flag on a tapered pole, as each screw gear banding adjusts individually. This equipment can be used to mount a double-winged light pole sign as well. Simply purchase two units for mounting street flags side-by-side. Assembly is simple and straight forward when using the included instruction sheet for reference. Please note: Max weight that this banner bracket can hold is 30lbs. 6.5" x 8.8" x 20.0"